Everything as planned. After months of waiting and rumors, and after the postponement of the presentation, originally planned at the Mobile World Congress 2017 in Barcelona, ​​Samsung has finally unveiled the new Galaxy S8 and the S8 Plus variant. They are two smartphones with giant screens, which Koreans have managed to frame in an aluminum body that still fits in your pocket, and also easily in the user's hand. The trick lies in the absence of edges on the sides, and in minimizing the up and down edges, so that the start button is no longer a physical button, but a pressure sensor integrated under the glass. In this way, the screen of the Galaxy S8 can occupy almost all the front of the phone, with a great aspect ratio of 18.5:9 that improves panoramic photos and video recording and also allows enough space to place two applications at the same time, either vertically or horizontally. To accommodate so much screen, the fingerprint sensor has moved to the back, next to the camera. Samsung not only offers the fingerprint as a method of unlocking, because with the S8 also supports biometric recognition, with the option of choosing between iris scanning and facial recognition. The new smartphones also stand out by incorporal virtual assistant Bixby, whose appearance is one of the main novelties of the market of voice assistants. For the rest, and remembering that we have already made known all its specs backwards, it should be noted the similarity and evolution in the design with respect to the previous devices of the family. 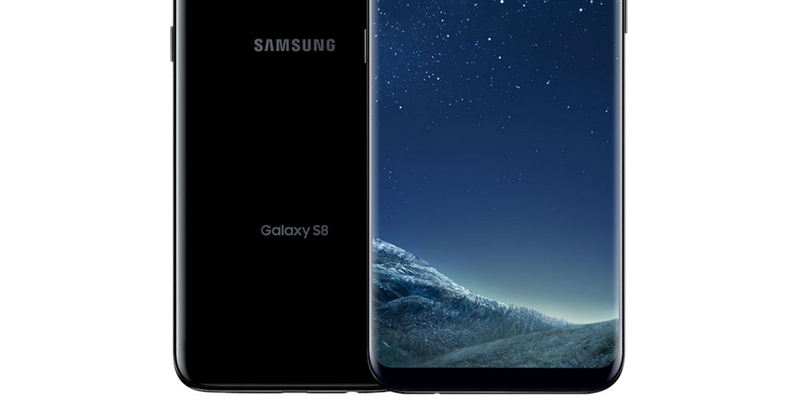 The Galaxy S8 features a curved screen at the sides, and the same design also accompanies the aluminum back panel to the metal side frame, creating a perfectly symmetrical design between the front and rear. Something quite unique.